It’s not just about Wesleyan, I don’t think. Was Wesleyan your first choice? Do all your quirky, clever friends from High School go there and tell you about all the crazy things they do? 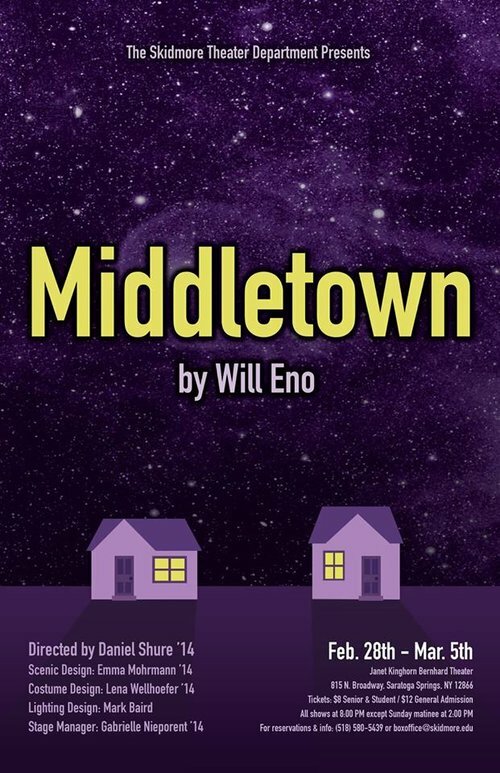 Well, to my knowledge, Middletown, the play by Will Eno, has nothing to do with the small Connecticut town in which Wesleyan is located. The award-winning play is the Skidmore Theatre Department’s Blackbox production for this semester, featuring the class of 2014’s finest thespians: Daniel Shure, Emma Mohrmann, Lena Wellhoefer, and Gabrielle Nieporent. In MIDDLETOWN, contemporary playwright Will Eno has created seemingly everyday characters with an extraordinary ability to articulate the deepest truths about being human: the clawing anxieties we cover up, the hopes and fears we cultivate, and the desperate need for connection with others. Their touching and often hilarious interactions also overlay a deeper fascination with how incredible it is to exist on this planet, in this universe.